Check out all of the Predator Series 10 photos by reading on. If you missed it, we posted the Card Backs for Predator Series 10 a few days ago. 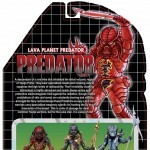 NECA has tweeted out first looks at Predator Series 10 cardbacks. Here we see the cardback and bios for the Lava Planet Predator and Hive Wars Predator. Check them out after the break! NECA has tweeted out a few new photos of some upcoming Predator figures. 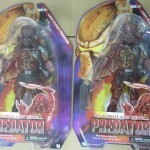 the new photos show us the Lava Planet Predator and the Nighstorm Predator in packaging. These figures are part of NECA’s Predators Series 10. They’re due to hit toy shelves next month. Toyark sponsor Big Bad Toy Store has posted a pre-order for NECA’s Predator Series 10. They are due out in September and you can get all 3 for $53.99. Included in this wave are the Lava Planet Predator, Hive Wars Predator, and Nightstorm Predator. Pre-order it Here. One of the most talked about debuts at Toy Fair 2013 was the milestone Series 10 Predators collection, an homage to the Kenner Predator collection from the early 90s. Taking inspiration from the original Kenner Expanded Universe designs, our team has applied modern sculpting, detail and articulation to upgrade these vintage Predators for the new millennium. Each Predator utilizes a different unique body, over 20 points of articulation, accessories and intricate deco. Special blister card packaging is an homage to the classic card art as well, featuring custom illustrated art and a color pallete that harkens back to the toy shelves of 1993. NECA has released some high resolution images of the Predator Series 10 figures. We’ve added them to the story. Read on to see the pics.